Bark Box... Better Than a Belly Rub? Better Than a Belly Rub? Have you ever heard of a Bark Box? I've only recently come across it online, and I absolutely adore the idea! It's a New York City-based company that sends your dog a fun box of gear, toys, and treats once a month with your subscription, with all of the products being safe and healthy for your best bud. This is such a novel idea! We all love to spoil our dogs, at least to some degree. And this way, you don't even have to leave the house... it gets delivered right to your door. Doesn't get any better than that! Disclaimer: I am not being paid to write this or advertise for Bark Box at all. I'm simply sharing what I think about this service/product. Bark Box was started in December 2011 by three dog owners in New York, and has grown dramatically since then. 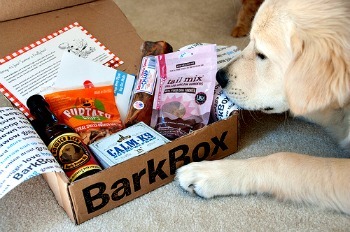 In 2013, they actually rebranded their name to Bark & Co., which includes this subscription service, BarkPost (website), and BarkCare (vet care). Basically, they will tailor the box's contents to the size of your dog. You know - appropriately sized toys for small, medium, and large sized dogs. You don't have to worry about getting a dinosaur-sized bone for your little Chihuahua (although he might enjoy that! ), or a toy so small that your Great Dane will swallow it like a pill. You get to choose the plan to subscribe to as well - monthly, 3-month, or 6-month is the length of plans that they have available now. And you can cancel at any time! I like that there are a number of options to choose from, and that you don't have to feel tied in for a year or anything like that. Oh, and here's a bonus: the company donates 10% of every purchase to dog rescue centres and shelters! A sampling of one month's box! Each month is a different surprise for your dog inside the box. Or I should say, a myriad of surprises... boxes generally come with 4 - 6 items in it. I think that's a pretty good value for what you pay, considering that those healthy dog treats can easily cost over $10 at the pet store. And toys aren't cheap either, especially if you want ones that won't be harmful to your doggy's health. This photo is just an example of what one month's box might include... that's 2 toys and 3 different types of treats in this box. It's so fun to see how owners post pics of their dog(s) opening up and enjoying the boxes on Bark Box' website. I mean, seriously, some of those photos are adorable! From what I can tell, they seem to send a lot of products that are made in the USA or Canada. I am a huge fan of supporting our own country's economy, so this is really nice to know. Also included in each box is a card that details the contents - super handy! I ordered Justice her first box today, so it should come mid-month. We'll see how it goes. To be quite honest, I'm a little unsure how many of the items she'll be able to enjoy as she has food allergies, but we'll give it a whirl. Unfortunately, they don't offer custom or "allergy-friendly" boxes at this point... hopefully this is something they'll try in the future! Glancing through photos of example boxes that I've seen on their website and online, though, it does look like they use mostly natural treats. I've even seen alligator jerky! Might sound weird to some of you, but for those of us with allergy dogs, "novel" proteins is the way to go to avoid the itchies. Don't worry, I'll be sure to come on here and let you know what Justice thinks of her first BarkBox. With pictures and everything! I wouldn't recommend something to you without trying it out myself, off course (er, I mean, without Justice trying it out). What's in the box? Photo courtesy of Loren Sztajer via Flikr. For now, they only ship to the US and Canada. So I apologize if you've gotten all excited about getting your pooch a Bark Box, only to find out that they don't ship to your country. Perhaps you'll come visit this side of the pond?